21st century access to traditional knowledge: today's global students learn with one another. Our students participate in their North Fork classes when they travel abroad for vacation or foreign exchange programs. They continue their progress and receive high school credits for North Fork curricula even though local schools give no credit for their Rotary or other foreign study classes. North Fork students have Skyped into class from Germany, Thailand, and Sweden, as well as during extra weeks on Spring Break in Hawaii. 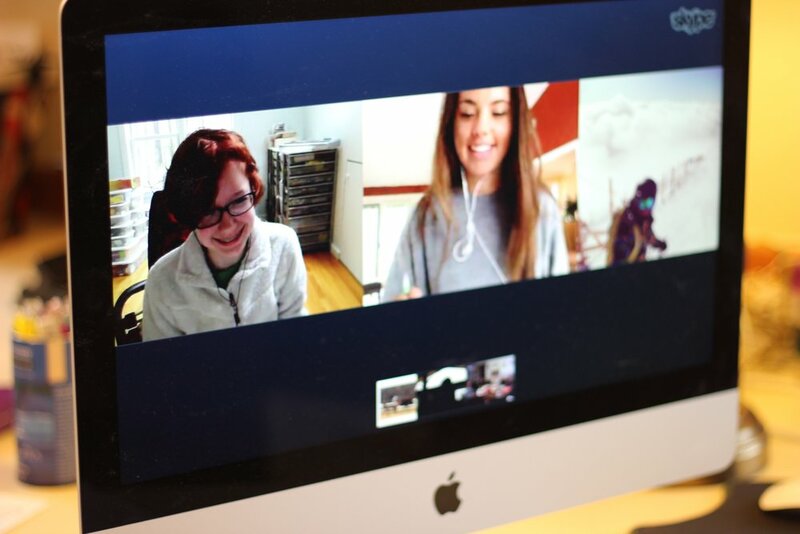 Skype access also allows students to attend class when they are unable to attend school due to sickness or injury. Often, students can listen and participate in classes that they would otherwise miss when they are healing at home. “[My siblings and I] Skype in on an actual classroom almost like we were sitting in a chair next to another student. People often ask how we turn in assignments, and keep up with the current reading for our studies without a screen full of tasks or reading selections each day. Our class consists of nine students, four of whom are actually in the classroom. Students who attend class via Skype are mailed books and worksheets to read and complete as they are assigned throughout the semester. We are challenged with goals for our number of revisions, which are improved drafts of current essays, as well as a number of edits which we correct and annotate for fellow classmates. Most of our assignments are transferred between our homes and the classroom through technology such as email, Dropbox, fax, and Skype. This makes for an awesome combination of learning and flexibility. Although Skype students are not physically present in the classroom, tuition and expenses are the same for Skype families as for local students, as the school would not exist as an accredited institution without its local McCall facility and resources. Credits are mailed to and placed on students' online school transcripts to replace course credits that they would otherwise take through those online platforms. “I had doubts when we first heard about North Fork and the whole Skype idea in August, but after the first class I knew it would work. Looking back I firmly believe that we couldn’t have had a better experience on any other platform or in any other place, and especially with any other teacher. Not only did you understand our situation well, but you also worked hard to make such a wonderful class possible. In fact we found ourselves questioning how you did it all multiple times throughout the year. You understood what interests us, what motivates us, and certainly how to captivate us. Most importantly you inspired us; you gave something I didn’t have much interest in a whole new perspective. You made stories come to life in our discussions, helping us find things we never expected to come off the pages of a novel. And I mean don’t even get me started on symbolism…! How to read and write weren’t the only things that we learned in your class though. (That twenty minutes a day of just thinking really pays off). Today I can say that I’m more confident than ever when I write, and I find more and more meaning in the pages of books than I ever have before. Students interact in various configurations on tablets, phones, and desktop platforms throughout class periods. Group study and peer discussion and analysis, as well as team presentations, are all facilitated through Skype.